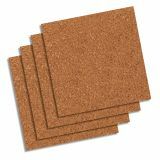 Quartet Cork Board Tile/Roll - Build a bulletin board of any size and shape with versatile cork panels. 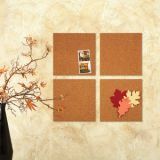 Use pushpins to securely hang documents, photos and more from these self-healing square cork tiles. 3/8 thick cork panels can be used separately or together to create a customized bulletin board. Included adhesive tape for mounting makes it easy to hang and fit tiles any space."